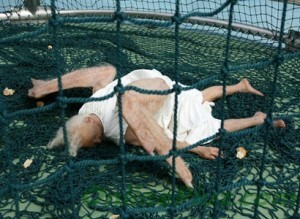 Art lovers—as well as people in general—were appalled by a sculpture depicting a fallen angel in gruesome detail that was unveiled in Beijing earlier this week. These pictures are not a real ‘fallen angel’. This extremely realistic artwork was created by Chinese artists, Sun Yuan and Peng Yu. This amazing sculpture, that is titled ‘Angel,’ depicts a fallen angel in the form of an old woman, her wings devoid of feathers, that seems to be sleeping or perhaps dead. It was made from silica gel, fiberglass, stainless steel, and woven mesh.